One day in the 1890s, Bernard F. Trappey Sr., longtime blacksmith on the McIlhenny clan’s plantation on Avery Island, in Louisiana, put down his anvil and walked off the job. He took with him some peppers—the sort of peppers grown on the island and used in the manufacturing of McIlhenny’s Tabasco Sauce. Their most determined adversary was Trappey. 1922 started with a bang for Trappey. He had sought trademark protection for the label on his sauce, and the McIlhenny Company protested. The patent office dismissed the opposition, and in January, 1922, the U.S. Court of Appeals for the District of Columbia affirmed. The court pointed to its 1910 decision approving cancellation of the McIlhenny trademark on the word “Tabasco” as applied to a pepper sauce, a word it found to be geographic and generic. It found that McIlhenny had shown no prospect of cognizible damage from Trappey’s use of the word. Reverie in the Trappey & Sons’ camp over victory in the D.C. Circuit was soon to end with a thud. The Fifth U.S. Circuit Court of Appeals—which four years earlier held “[t]hat the word ‘Tabasco,’ as applied to pepper sauce” meant McIlhenny’s sauce and no other—now affirmed an injunction against Trappey’s use of that prized word. The court acknowledged that Maunsel White had sold a Tabasco sauce “as far back as 1850,” but observed that sales of his sauce “appear to have ceased by the year 1867.” Edmund McIlhenny’s enterprise started in 1868, it recited, and Trappey lauched his business in 1896, meaning that “for nearly 30 years, the McIlhennys conducted this manufacture and sale without interference as to the name ‘Tabasco.’” During that time, the Texas-based appeals court found, the word “Tabasco” had gained a secondary meaning—the meaning being the McIlhenny sauce. Even if there was no federal trademark on the name, it was unfair competition for imitators to use it, the judicial tribunal decreed. If a sauce is made from Tobasco peppers, it is, generically, a “Tabasco peppers sauce” and, under precepts now etched in stone, generic descriptions can never gain a secondary meaning. In 1922, however, the concept of “secondary meaning” was new, and clay, not stone, was the medium upon which notions were whittled. The matter was remanded for a determination of Trappey’s profits from its infringing sales, and the district judge ordered Trappey to pay $5,073.30 to McIlhenny. In 1926, the Fifth Circuit upheld the determination. Trappey & Sons stopped using the word “Tabasco,” except in its list of ingredients. 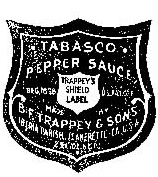 “Trappey’s Pepper Sauce” endured, and the company added a multitude of products to its line, including canned Tabasco peppers. Among the many myths surrounding Tabasco Sauce is the one that the McIlhennys ultimately vanquished their rival by buying it out. Actually, the Trappeys sold the company in 1982 to brothers Perry and Wiltz Segura; the Seguras sold it in 1988 to Jem Brands Inc.; Jem disposed of the canned foods operations in 1991, and later that year, the bottled foods operation was purchased by McIlhenny. Edmund McIlhenny’s heirs thus came into ownership of Bernard Trappey’s sauce, holding it for seven years. McIlhenny Company sold its entire Trappey line in 1998 to B&G Foods, Inc.